Without a doubt UNIS Hanoi is unique, but what makes us UNiquely UNIS? 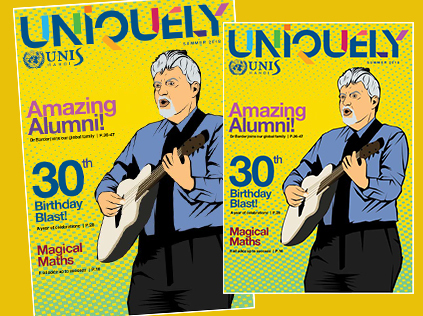 This week, our Summer 2018 edition of our bi-annual school magazine, UNiquely UNIS, was sent home for every family to enjoy a new collection of insider stories demonstrating our commitment to our students and our promise to you. This magazine was created in response to parents asking us to really show them and share with them a UNIS Hanoi education experience. It is our attempt to go beyond a quick glimpse and give you a deep dive into a variety of different, programmes, projects and initiatives that are part of your children's daily experience. You can read it and all the past editions of UNiquely UNIS Online or read the Summer 2018 edition directly. Our commitment to a Culture of Coaching in our professional development for teachers and the impact on your children. We give an overview of this year's graduating class and demonstrate the talent and diversity in our students culminating year. We put our Maths programmes under the spotlight and find out if it all adds up! Our commitment to education in Vietnam takes our technology teacher conference to a new level. Our grade 10 students turned 'career detectives' with the help of scores of parents and partners. And in an alumni story special we share perspectives on RESPONSIBILITY with eight outstanding stories of the ways in which our students have gone on to make an impact in the world and are still living the UNIS Hanoi Mission. Enjoy some inspirational summer reading!